Jolly Tots Too! Is a Daycare and Preschool center located near Easton Town Center. Parents working in the area can conveniently reach our daycare, because we are less than 5 Miles away in Gahanna, East of Morse Rd. and North on N. Hamilton Rd. Our address is 5511 N. Hamilton Road in Gahanna, Ohio. The childcare center occupies approximately 12,200 square feet. The facility has 11 classrooms and one indoor muscle room, each having its own emergency exit. There are two large outdoor playgrounds with rubber mulch and privacy fences for safety. The original Jolly Tots program was established for the purpose of providing safe, reliable child care for the working family. The childcare center has since successfully established noted creditability within the New Albany and Gahanna communities (we are just a convenient drive from Easton Town Center) for delivery of high-quality child-care services. Our daycare and preschool services provide love, nurturing, and guidance while introducing educational learning experiences that stimulate the child’s mind, body and spirit to help them develop in a most natural, healthy manner. We incorporate everything from Music Appreciation to Language and Multiculturalism. We love to incorporate music throughout our program at Jolly Tots, Too! We feel that music can help us teach new concepts, encourage verbal language skill development as well as literacy. We do this by singing songs and dancing which promotes large motor development. Once a month we have a special music teacher that meets with each classroom to introduce new instruments and songs. These multicultural components are designed to expose the children to a variety of cultural experiences, traditions, and foreign languages. Children receive instruction in Spanish and Sign Language each week. These lessons are directly related to the topics studied through the weekly curriculum and increase the child’s awareness of the people whose culture they are studying. Every year we also have a multicultural fair where children visit different countries throughout our center. Our child care providers are selected based on their education, dependability, trustworthiness, child care experience, and ability to nurture young children. Personal and professional references and personal background checks are carefully screened. We maintain consistent child and child care provider interaction to promote continuity and enhance each child’s sense of development and well-being. We takes pride in the longevity of our child care providers, as many of them have been with us for over 10 years, proving our dedication to commitment and consistency throughout our daycare center. Our Infant Care programs are for children ages 6 weeks to 18 months. Infancy is a time for bonding, therefore, it is the most difficult time for both parent and child to be separated. An infant’s rapid growth requires energy and patience from the child-care provider. Although all stages of development are important, special emphasis is required during infancy as it is a time for the development of security and trust—a time when the attachment/bonding process takes place. Infants are cuddled, rocked, and loved. The infant stimulation program contributes to the physical, intellectual, and social maturation of each child. We are not far from Easton Town Center, so your kids will be close by. Young toddlers are particularly curious about everything. They are exploring their power over the child-care provider through obstinacy, temper tantrums, and negativism. During this stage, it is especially important to provide consistency in allowing choices, setting limits, and utilizing appropriate guidance methods. Providing nurturing consistency and support enables children to understand expectations and meets their need for feelings of safety and security. The preschooler is embarking on the age of discovery, inventiveness, curiosity, and development of behavior patterns. At this time, children are rapidly developing skills such as exploration of language and reason, and comprehension of symbols. Gentle guidance, structure, and encouragement assist them in accomplishing these tasks. Jolly Tots Too is a convenient drive from Easton Town Center and is perfect for parents and kids. During Pre-Kindergarten children develop maturity and independence. Our child care providers offer a stimulating yet challenging environment. We designed the program to increase each child’s sense of self-esteem, self-concept, self-worth and sense of belonging. Hence, our goal is to help them form a strong cognitive basis for the school years to follow. Our Pre-Kindergarten curriculum has been designed to prepare children for the Kindergarten experience. The learning-center curriculum exposes children to basic concepts of education. As a result, math, science, music, language arts, multicultural, and writing skills are learned. The classroom atmosphere promotes children’s interest and exploration needs. The Pre-Kindergarten classrooms are taught by elementary and early childhood educators. The full day Kindergarten Program sets the stage for your child’s higher-learning areas. During this stage of development, children are very active, curious, and eager to learn. They are much more cooperative and able to develop close friendships with their peers. Their desire to be independent and assume responsibility makes them truly delightful little individuals. Curriculum exposure includes a variety of opportunities designed to meet the individual learning needs of each child. The teacher incorporates a combination of teaching methods, such as teacher-to- child or a group of children, child-to-child, and group cooperative experiences (learning centers). We are very close to Easton Town Center, therefore Jolly Tots Too provides a convenient daycare service for busy parents working or passing through the area. Onsite Daycare Nurse at Jolly Tots Too! We are very proud of our on-site nurse Sue Rikk who provides compassionate care to keep our young ones healthy at all times! We have a health and safety program that stands out among the crowd. Because we have a Registered Nurse present to answer questions, medical concerns are put to ease. Our teachers regularly practice healthy and safe protocols to prevent the spread of germs and illness within the classrooms. Our staff is educated in CPR, First Aid, Communicable Disease, and Child Abuse/Neglect. The Ohio Department of Job and Family Services issues our license, and we strictly follow all rules. Parents are welcome to review our license and inspection reports. Also, the reports are always posted on the parent information board at the front office. In addition, the health inspection report, fire inspection report, and record of fire and severe weather drills are also posted. 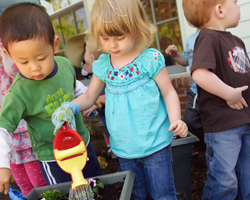 Our childcare center’s program combines early life-style and health and wellness education programs. A comprehensive, educational, learning-center curriculum is provided and directed toward the individual needs of each child in order to promote the optimal level of development. Each child is provided with the best possible foundation, therefore helping them accomplish the growth and developmental milestones.